My dad was a developer. He built one of the first “funnel developments” on Lake Sunapee called Fisher’s Bay. This type of development, using a small amount of shore frontage to accommodate tons of building lots in the back land is now forbidden in New Hampshire land protection laws. I remember, at age 13, standing in front of the bulldozer when he was punching the first road in Fisher’s Bay, saying, “Dad, you can’t do this, it’s our family land”, and his reply was, “Get out of the way son, we need to do this.” Where was Edward Abbey when I needed him. Fortunately I’ve not seen any of the inheritance from this development. I’ve been a radical since I was little. Bob Bell a local developer, with a capital “D”, reminds me a bit of my dad. I don’t know the guy, and have only seen him present his blueprints at a zoning meeting one night. He is, no doubt, good at what he does, and is passionate about his goals. But he’s taken it to a whole another level that I think my dad would be frown upon. Bell seemed like a mad scientist, or more accurately, a grown up kid with a chemistry project that’s destroying the place, and with no one willing or able taking his toys away. His specialty is high impact switchback roads and ridgeline clearcuts on a big scale. Other communties might have more protections in place, but here, he’s pretty free to slash and burn. 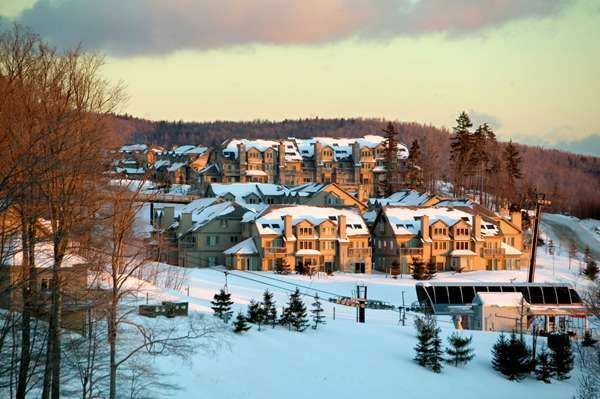 Then there’s Mountain Leach, Oh I’m sorry, I meant Mountain Reach, Mount Sunapee’s only “Ski-in Condos”. Great. I think people should bushwack-in and bushwack-out just like the rest of us if they want to be near a state park ski area boundary with a buffer zone. Unfortunately, the two hundred foot stretch where there isn’t an actual buffer zone, someone took advantage of it. It’s akin to one’s immune system have a whole in it. While I do see the value of developments leaving open space by clustering development and lots, the land developer’s time could be better spent actually preserving the land working for easements rather than making all that cash on destroying the rural standard of living with developments, and getting real job. These guys seem to have little understanding, and consequently regard, for the land, the wildlife and communities that were here before. Which brings me back to the Muellers and their “Terrain Tug of War”. Ever notice how some people and corporations continually attract drama to themselves. I wonder if the Muellers have recently stopped to consider why they are in (or soon to be in) two lawsuits at the same time with two different government agencies, agencies which have wisely decided to protect the public lands with which they’ve been charged? The mind of a land developer is, in some ways, not like ours. It sees green in “unobtainium” land. And, it sees red when anyone gets in the way of their world view of development for the masses of skiers and condo buyers. That’s so ‘90s. But maybe there’s hope. I appreciate Mt. Sunapee Manager Jay Gamble’s civility when we cross paths, and am optimistic that someday he may actually see when enough is enough, and pass this revelation on to his boss Tim Mueller. 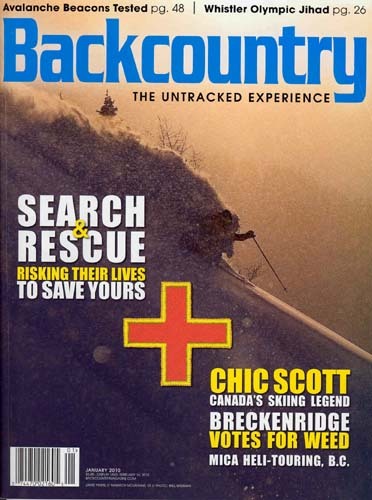 Below is a recent piece by Mark Reaman editor of the Crested Butte Weekly writing for BackCountry Magazine. A Good Mag. We recommend it. In an admittedly unusual move, the United States Forest Service turned down a request by Crested Butte Mountain Resort to expand its lifts onto nearby Snodgrass Mountain. This has upset some business owners in Crested Butte, Colorado. But many in the backcountry community are pleased with the surprising decision. CBMR owners Tim and Diane Mueller have been working with the federal agency for five years in a so-called pre-NEPA (National Environmental Policy Act) process to address concerns of geology, public support and land use. Richmond said the plan would not enter NEPA. CBMR President Tim Mueller was shocked. “It is difficult to express the depth of our disappointment regarding this decision,” he said. “We I have worked methodically with the U.S. Forest Service over the past five years to address concerns and meet and exceed requirements with the goal of entering into the NEPA process, as so many of our competitors have done.” Mueller said the ski company was investigating how to appeal the decision through the I Forest Service. If that wasn’t possible, he said the company would likely go to court. 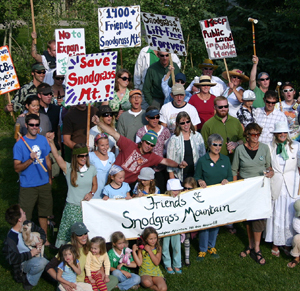 Fortunately, Friends of Mount Sunapee and Friends of Snodgrass Mountain have been successful thus far in protecting open space, hopefully for generations. Want to help? Make a donation to help us keep up the good work. Also speak up and speak out. The land needs a voice of many. FOMS and FOSM have had been in contact and supporting each each other’s work and sharing updates on what are plans for owner Tim Mueller, of both resorts plus the “Mother Ship” Okemo in Vermont. 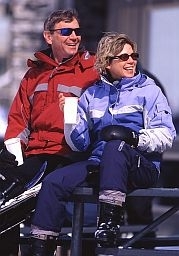 Image at right: The author at right, a co-founders of FOMS with a co-founder of FOSM in Crested Butte winter of 2008. Snodgrass Mountain is in the background. Our mission advocates for protection of Mount Sunapee State Park for its essential public values; conservation of the Lake Sunapee watershed and Sunapee highlands; and preservation of the unique character and natural beauty of the rural communities in the mountain’s shadow. This entry was posted on 13/02/2010 at 07:07 and is filed under Conservation, Environment, Focus on MSI People, Leadership, Power of Place, Room For Improvement, Sustainable Living/Communities. You can follow any responses to this entry through the RSS 2.0 feed. You can leave a response, or trackback from your own site.